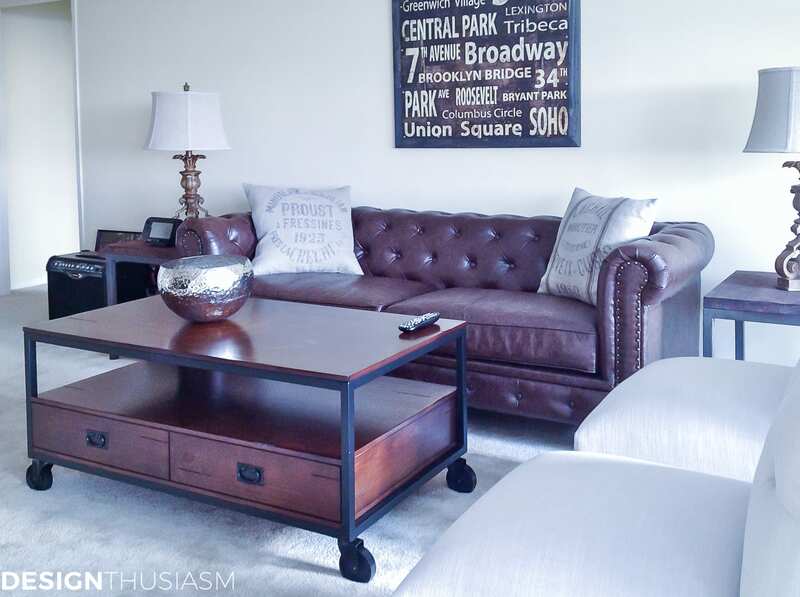 Inside: One mom takes on decorating her son’s first apartment, giving him super cool affordable apartment living room ideas for the bachelor pad. 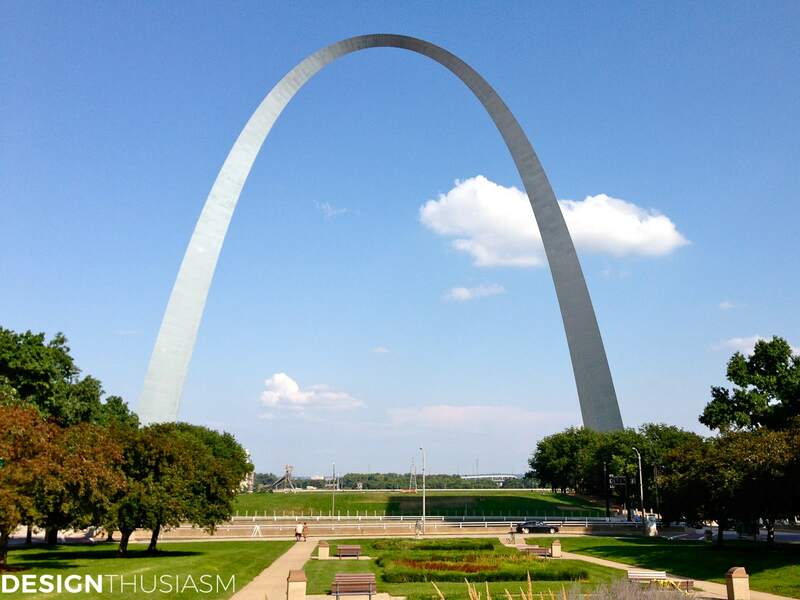 Last summer my son relocated to St. Louis for his first post college job. Given that his dorm rooms and college quarters had always come furnished, he was leaving the East Coast with not one piece of furniture. Apart from his jeans and his video games, his apartment would be a complete blank slate. This may have been disorienting for a young adult male, but it was a dream for a mom who delights in home design. The trick would be finding a look that would honor his personality (and budget, as he was participating) while not channeling “found at the side of the road” decor. The two things in our favor were that the apartment came with neutral walls and carpet and that my son is a pretty neat and organized guy. I knew that whatever we put in place would look exactly the same the next time we visited, so I didn’t worry too much about finding things that were sturdy enough to last a lifetime. Instead we focused on his general interests and personality, as well as the functionality of his apartment to serve his new lifestyle. We went for a masculine vibe with an industrial edge, to honor his New York City roots and his technology driven world. 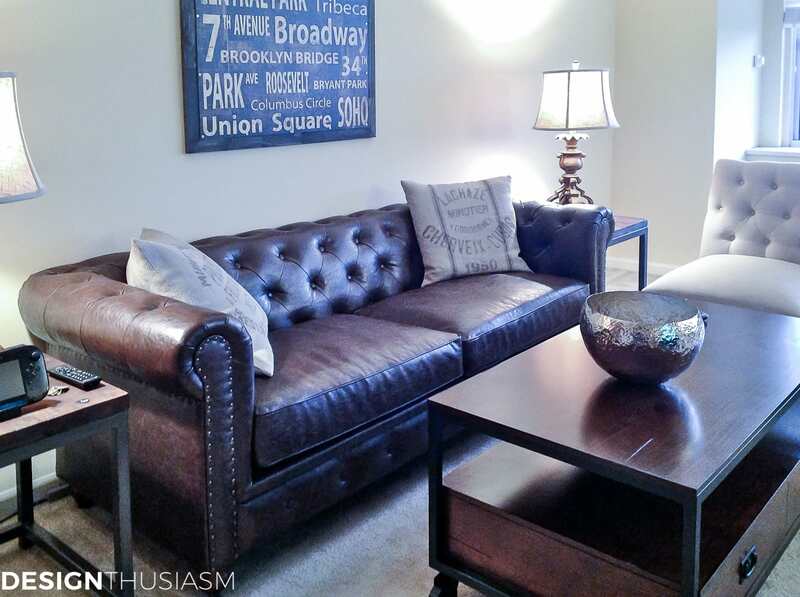 The chesterfield sofa lent a nice masculine grounding to the room and the grain sack pillows add comfort. 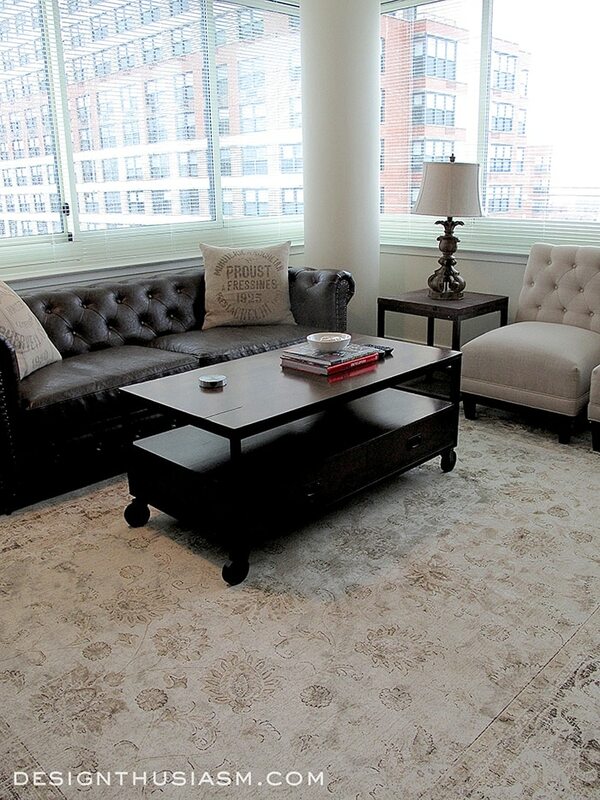 The industrial coffee table provides storage and the urban painting over the sofa adds a reminder of home. The hammered metal bowl was mom’s addition, a decorative piece my son still doesn’t quite get. Yet he dutifully keeps it there all the while doubting my insistence that it would make a great popcorn bowl for game day. To lighten the look we went with beige linen guest chairs. No doubt a big cushy club chair would have been infinitely more inviting, but you’d be surprised how comfortable these are. They’ve even been pushed together and slept on! St. Louis has become a gateway indeed for my son into the world of independence! To see the rest of the bachelor pad series, the kitchen, dining room and terrace can be seen in Part 2 and the bed and bath can be viewed in Part 3. Great look for a man…especially your son. Love the color of the chairs. The cabinet is great to keep your video games stored away. looking forward to parts 2 and 3. Thanks Linda! It’s a work in progress, but a good start I think for his first place. I’m sure he will personalize it in time… 🙂 Yes, the next 2 parts are coming! Lory, your son’s place is wonderful! What a great space for a young man to start out in the world! I am sure he appreciates your touches! Thanks! Yes, he appreciates all but the hammered pewter bowl… lol! 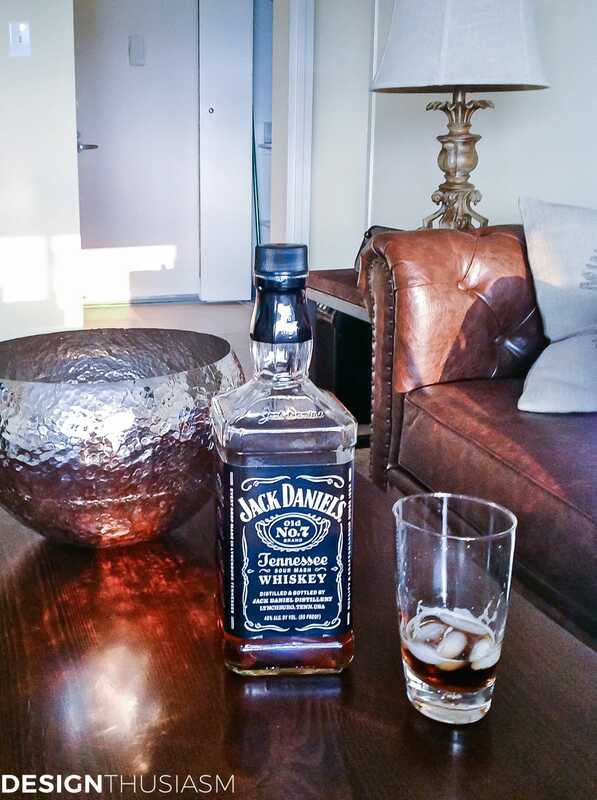 Wow what a tidy apartment, something has rubbed off on your son from you :), I wish my boys were design orientated or at least kept their places tidy. I love the sofa, very masculine and will carry him through for years, even though it is classic you can use a peice such as this in an eclectic, traditional or mix with industrial style pieces. He can change the look whenever he wants. 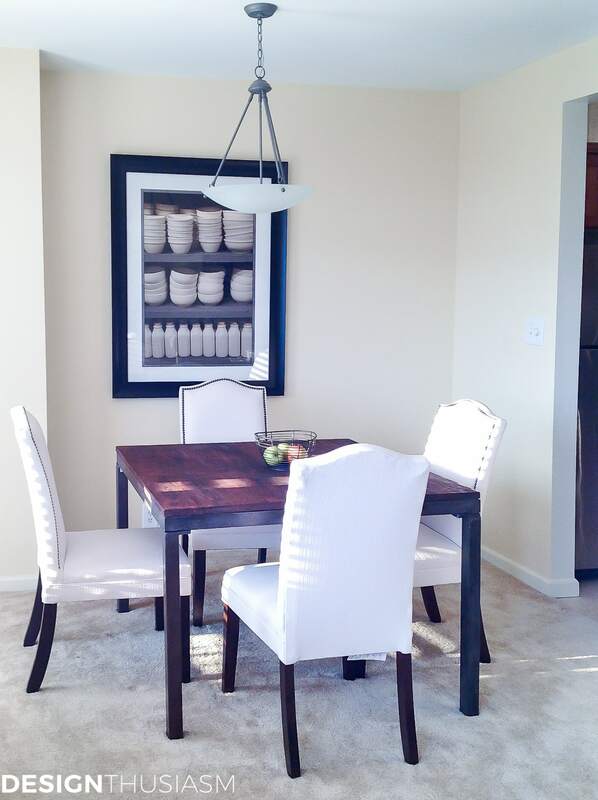 I adore how the blend of styles brings about a “taliored” look. This would be a “perfect” fit for our lower level Family Room. Thanks for sharing this masculine appealing decor!!! Lory, this post caught my eye on one of the link parties (can’t remember which one). I love what you did for your son here, it looks very classy and masculine. 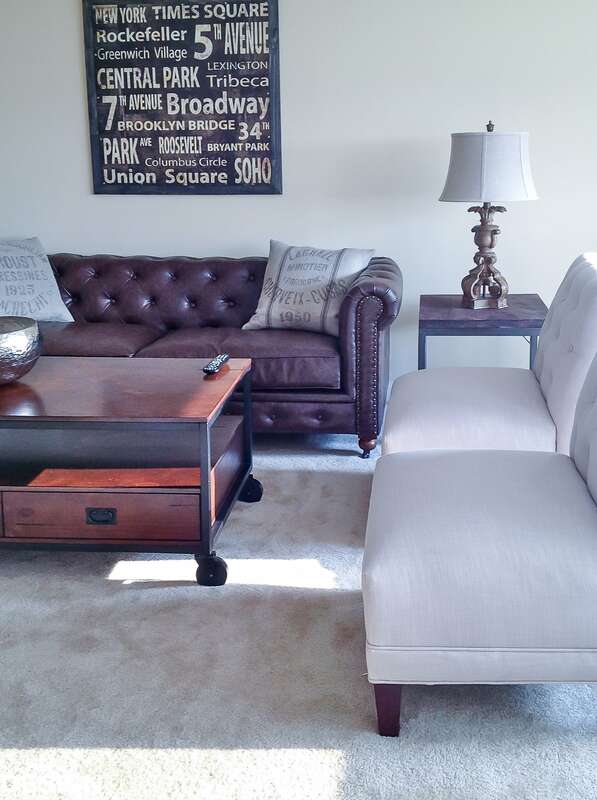 I know exactly how comfortable those chairs can be – I had a huge sectional that was my husband’s from his bachelor days, and I broke it up into two slipper chairs and a loveseat (leaving the corner chair out). I love the chairs! Thank you Rita!! There will be 2 more parts in the series – the kitchen/dining room/terrace and then the bedroom, bath & desk alcove. As for the bowl, he just keeps shaking his head. Everything we got I had him come to the store and test out, but a few of the decorative pieces like the bowl became more of a family joke than anything else. I still think it’s perfect for popcorn! Love it! My son graduates in December and I already purchased the leather sof for his apartment! Love the pillows …..where did they come from? I am a designer as well! Thanks Leslee! 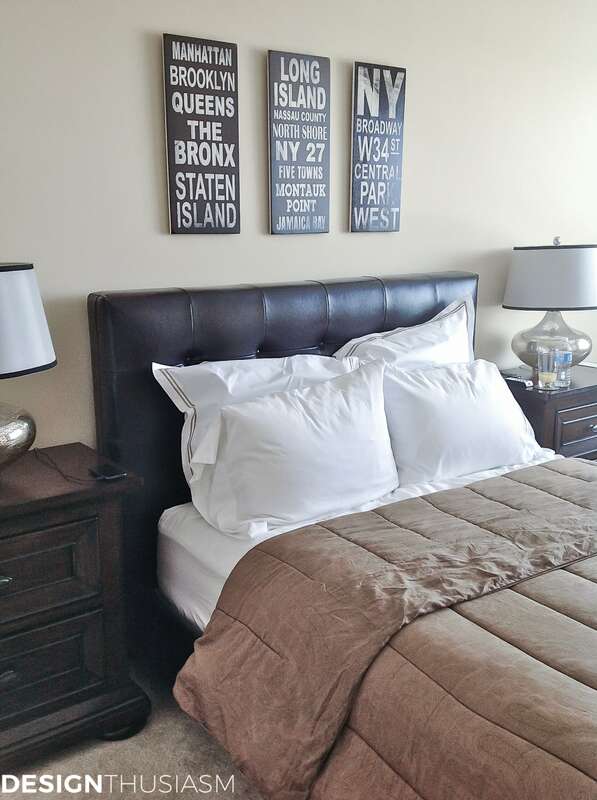 The pillows are from Restoration Hardware. Actually I think I bought them as pillow covers and the inserts separately. This is a really, really slick look. A home that any young man would be proud of and thrilled to come home to each night after a hard day of work! 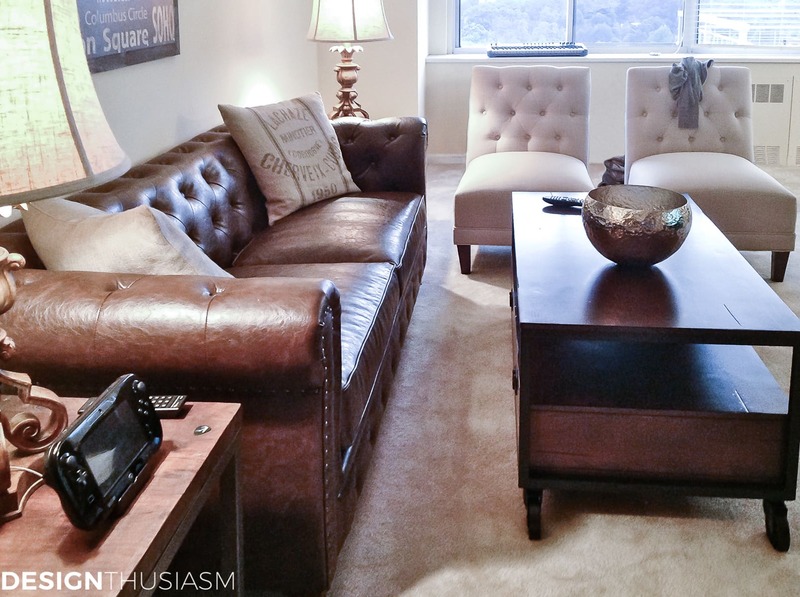 There’s plenty of space for entertaining friends over the game or whatever, and the tufted leather sofa is right on with its very manly look!!!!!! I also LOVE that media stand!!!!!! Your son should feel quite at home with his new place!! 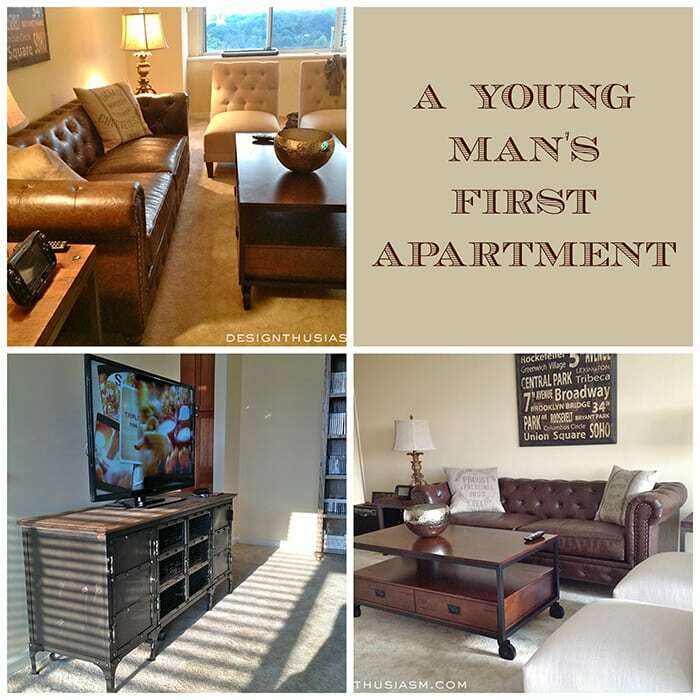 The living room looks perfect for a young professional man!! We live near St. Louis. It’s a great place and we love visiting it’s many sights and events – hope your son enjoys living there!! Thanks Zenda, and yes he does. It’s very easy there. He’d never have such a nice apartment in the New York area. It would be like 3 times the price! 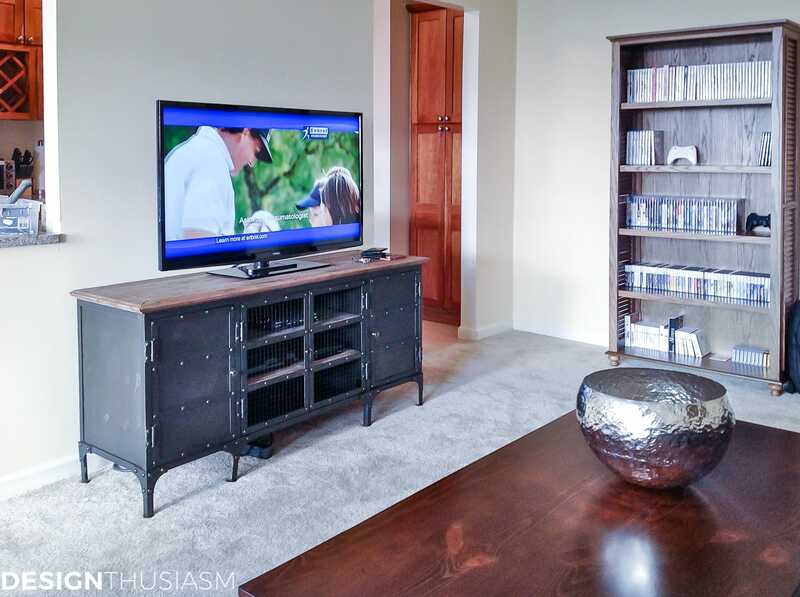 With the clean lines and airs of sophistication this apartment decor offers, why would you choose to display the media collection rather than put it behind doors? Wow! The apartment is beautiful! You’ve given me inspiration for updating my own bedroom! Thanks Rebecca! Glad you were inspired… 🙂 Thanks for visiting! your son apartment looks clean and it looks like a nice apartment i have a son and i have been doing his apartment and just the other day he had a lady friend over and she aked him was he gay he had to Lol on that one because my son apartment is so what to looking like your son`s apartment he has a nice couch and a love seat with his end tables and his apartment has a nice fireplace he has his flat screen t.v sitting on the fireplace. he is a welder he made his own table from scrap i found these really nice bar stools at the goodwill at a good price. again i like how you did your son`s apartment my son is working on his bedroom he has everything except a dresser, a lady gave him a vintage looking one all he has to do is pick it up. Thanks, Belinda and that’s funny what he was asked. He can always say he hired a decorator if he doesn’t want to say his mom decorated it… 😉 Thanks for visiting! Wonderful! Love the look! Industrial is a perfect style for a young man and I like how the furniture stores all his goodies perfectly! This takes me back a few years when I helped my son with his first apartment. He surprised me with the nice things he was interested in and the overall look he wanted. His now wife told his mom when they first met “he has a really nice apartment with great furniture”! LOL… I got a kick out of that! What a great room, and what a lucky son to have you help him out with decorating his first grown-up place! 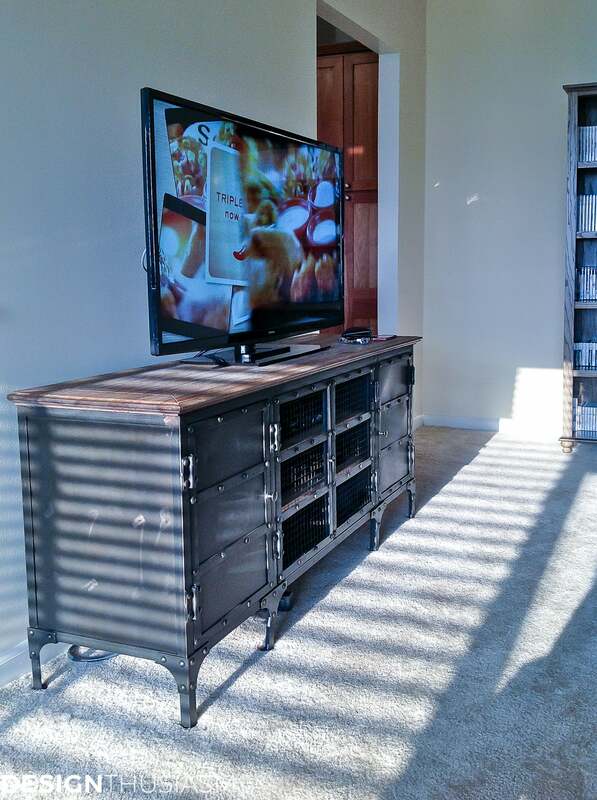 I have two sons, and I know how hard it is to convince young adult men they need something more than a huge TV, ratty futon and old crates to make a space feel like home (and one day attract a spouse/partner/significant other, etc.). I can only hope when my guys get their own apartments that they keep them as neat and tidy and wonderful as your son’s apartment! Well done! Thanks so much! He’s actually just naturally very neat, although couldn’t care less about design and would certainly have gone for the futon had I not intervened… 😉 Thanks for visiting and for taking the time to comment!